Huey Percy Newton (February 17, 1942 – August 22, 1989) was a revolutionary African-American political activist who, along with Bobby Seale, co-founded the Black Panther Party in 1966. He continued to pursue graduate studies, eventually earning a Ph.D. in social philosophy. In 1989 he was murdered in Oakland, California by Tyrone Robinson, a member of the Black Guerrilla Family. Newton was born in Monroe, Louisiana, in 1942 during World War II, the youngest of seven children of Armelia (Johnson) and Walter Newton, a sharecropper and Baptist lay preacher. His parents named him after Huey Long, former Governor of Louisiana. Ouachita Parish had a history of violence against blacks since Reconstruction. According to the 2015 report by the Equal Justice Institute, from 1877 to 1950, a total of 37 black people were documented as lynched in that parish. Most murders had taken place around the turn of the 20th century. This was the fifth-highest total of lynchings of any county in the South. In 1945, the Newton family migrated to Oakland, California, as part of the second wave of the Great Migration of African Americans out of the South, with most going to industrial cities of the West Coast for jobs in the defense industry; some continued to settle in northern and midwestern cities as well. The Newton family was close-knit, but quite poor. They moved often within the San Francisco Bay Area during Newton's childhood. Despite this, Newton said he never went without food and shelter as a child. As a teenager, he was arrested several times for criminal offenses, including gun possession and vandalism at age 14. Growing up in Oakland, Newton stated that he was "made to feel ashamed of being black." During those long years in Oakland public schools, I did not have one teacher who taught me anything relevant to my own life or experience. Not one instructor ever awoke in me a desire to learn more or to question or to explore the worlds of literature, science, and history. All they did was try to rob me of the sense of my own uniqueness and worth, and in the process nearly killed my urge to inquire. Newton graduated from Oakland Technical High School in 1959 without being able to read, although he later taught himself; The Republic by Plato was the first book he read. Newton attended Merritt College, where he earned an Associate of Arts degree in 1966. After Newton taught himself to read, he started questioning everything. In his autobiography, Revolutionary Suicide, he states: "Most of all, I questioned what was happening in my own family and in the community around me." This was the start of his involvement in the civil rights movement. Newton continued his education, studying at San Francisco Law School, and the University of California at Santa Cruz, where he earned a bachelor's degree. He was a member of Phi Beta Sigma Fraternity, Inc. He later continued his studies and in 1980, he completed a PhD in social philosophy at Santa Cruz. As a student at Merritt College in Oakland, Newton became involved in politics in the Bay Area. He joined the Afro-American Association (AAA), became a prominent member of Phi Beta Sigma fraternity, Beta Tau chapter; and played a role in getting the first African-American history course adopted as part of the college's curriculum. He read the works of Karl Marx, Vladimir Lenin, Frantz Fanon, Malcolm X, Mao Zedong, Émile Durkheim, and Che Guevara. During his time at Merritt College, he met Bobby Seale, and the two co-founded the Black Panther Party for Self Defense in October 1966. Based on a casual conversation, Seale became Chairman and Newton became Minister of Defense. Newton learned about black history from Donald Warden (who later would change his name to Khalid Abdullah Tariq Al-Mansour), the leader of the party. Later Newton concluded that Warden offered solutions that didn't work. In his autobiography, Newton says, "The mass media, the oppressors, give him public exposure for only one reason: he will lead the people away from the truth of their situation." The Black Panther Party was an African-American left-wing organization working for the right of self-defense for African Americans in the United States. Newton said that the Black Panther Party's beliefs were greatly influenced by Malcolm X: "Therefore, the words on this page cannot convey the effect that Malcolm has had on the Black Panther Party, although, as far as I am concerned, the testament to his life work." The Party achieved national and international renown through their deep involvement in the Black Power movement and the politics of the 1960s and 1970s. The Party's political goals, including better housing, jobs, and education for African Americans, were documented in their Ten-Point Program, a set of guidelines to the Black Panther Party's ideals and ways of operation. The group believed that violence—or the threat of it—might be needed to bring about social change. They sometimes made news with a show of force, as they did when they entered the California Legislature fully armed in order to protest a gun bill. They were from families that had left the South, where lynchings and other violence against blacks had caused thousands of deaths. Newton adopted what he termed "revolutionary humanism". Although he had earlier visited Nation of Islam mosques, he wrote that "I have had enough of religion and could not bring myself to adopt another one. I needed a more concrete understanding of social conditions. References to God or Allah did not satisfy my stubborn thirst for answers." Later, however, he stated that "As far as I am concerned, when all of the questions are not answered, when the extraordinary is not explained, when the unknown is not known, then there is room for God because the unexplained and the unknown is God." Newton later decided to join the Church[clarification needed] after the party disbanded during his marriage to Fredrika. Newton would frequent pool halls, campuses, bars and other locations deep in the black community where people gathered in order to organize and recruit for the Panthers. While recruiting, Newton sought to educate those around him about the legality of self-defense. One of the reasons, he argued, why black people continued to be persecuted was their lack of knowledge of the social institutions that could be made to work in their favor. In Newton's autobiography Revolutionary Suicide, he writes, "Before I took Criminal Evidence in school, I had no idea what my rights were." Newton also wrote in his autobiography, "I tried to transform many of the so-called criminal activities going on in the street into something political, although this had to be done gradually." He attempted to channel these "daily activities for survival" into significant community actions. Eventually, the illicit activities of a few members would be superimposed on the social program work performed by the Panthers, and this mischaracterization would lose them support in both the white and black communities. Newton and the Panthers started a number of social programs in Oakland, including founding the Oakland Community School, which provided high-level education to 150 children from impoverished urban neighborhoods. Other Panther programs included the Free Breakfast for Children Program and others that offered dances for teenagers and training in martial arts. According to Oakland County Supervisor John George: "Huey could take street-gang types and give them a social consciousness." In 1982, Newton was accused of embezzling $600,000 of state aid to the Panther-founded Oakland Community School. In the wake of the embezzlement charges, Newton disbanded the Black Panther Party. The embezzlement charges were dropped six years later in March 1989, after Newton pleaded no contest to a single allegation of cashing a $15,000 state check for personal use. He was sentenced to six months in jail and 18 months probation. He had also expressed support for Palestinian independence. Newton had been convicted of assault with a deadly weapon for repeatedly stabbing another man, Odell Lee, with a steak knife in mid-1964. He served six months in prison. By October 27–28, 1967, he was out celebrating release from his probationary period. Just before dawn on October 28, Newton and a friend were pulled over by Oakland Police Department officer John Frey. Realizing who Newton was, Frey called for backup. After fellow officer Herbert Heanes arrived, shots were fired, and all three were wounded. Heanes testified that the shooting began after Newton was under arrest, and one witness testified that Newton shot Frey with Frey's own gun as they wrestled. No gun on either Frey nor Newton was found. Newton stated that Frey shot him first, which made him lose consciousness during the incident. Frey was shot four times and died within the hour, while Heanes was left in serious condition with three bullet wounds. Black Panther David Hilliard took Newton to Oakland's Kaiser Hospital, where he was admitted with a bullet wound to the abdomen. Newton was soon handcuffed to his bed and arrested for Frey's killing. A doctor, Thomas Finch, and nurse, Corrine Leonard, attended to Newton when he arrived at the hospital, and Finch described Newton as 'agitated' when he was asking for treatment and that Newton received a tranquilizer to calm him. Newton was convicted in September 1968 of voluntary manslaughter for the killing of Frey and was sentenced to 2 to 15 years in prison. In May 1970, the California Appellate Court reversed the conviction and ordered a new trial. After two subsequent trials ended in hung juries, the district attorney said he would not pursue a fourth trial, and the Alameda County Superior Court dismissed the charges. In his autobiography, Revolutionary Suicide, Newton wrote that Heanes and Frey were opposite each other and shooting in each other's direction during the shootout. Writer Hugh Pearson, in his book Shadow of the Panther, alleges that Newton, while intoxicated in the hours before he was shot and killed, claimed to have willfully killed John Frey. Although this claim has been repeated elsewhere based on Pearson's account, the allegation remains contentious, and has not been corroborated by others. In 1970, after his release from prison, Newton received an invitation to visit the People's Republic of China. On learning of Nixon's plan to visit China in 1972, Newton decided to visit before him. Newton made the trip in late September 1971 with two comrades, Elaine Brown and Robert Bay, and stayed for 10 days. At every airport in China, Newton was greeted by thousands of people waving copies of the "Little Red Book" (officially titled Quotations from Chairman Mao Tse-tung) and displaying signs that said "we support the Black Panther Party, down with US imperialism" or "we support the American people but the Nixon imperialist regime must be overthrown". During the trip, the Chinese arranged for him to meet and have dinner with an ambassador from the DPRK (North Korea), an ambassador from Tanzania, and delegations from both North Vietnam and the Provisional Revolutionary Government of South Vietnam. Newton was under the impression he was going to meet Mao Zedong, Chairman of the Communist Party of China, but instead had two meetings with the first Premier of the People's Republic of China, Zhou Enlai. One of these meetings also included Mao Zedong's wife Jiang Qing. Newton described China as "a free and liberated territory with a socialist government". On August 6, 1974, Kathleen Smith, a 17-year-old Oakland native working as a prostitute, was shot; she died three months later. According to the prosecutor handling the case, Newton shot Smith after a casual exchange on the street during which she referred to him as "Baby", a childhood nickname he hated. Newton is also alleged to have assaulted his tailor, Preston Callins, after Callins called him "Baby". Newton posted bond after being arrested for pistol-whipping Callins. Newton was subsequently arrested a second time for the murder of Smith, but was able to post an additional $80,000 bond, thus securing his release until trial. Newton and his girlfriend (later his wife) Gwen Fontaine then fled to Havana, Cuba, where they lived until 1977, which prevented further prosecution on the two charges. Elaine Brown took over as chairperson of the Black Panther Party in his absence. Newton returned to the United States in 1977 to stand trial for the murder of Smith and the assault on Callins. In October 1977, three Black Panthers attempted to assassinate Crystal Gray, a key prosecution witness in Newton's upcoming trial who had been present the day of Kathleen Smith's murder. Unbeknownst to the assailants, they attacked the wrong house and the occupant returned fire. During the shootout one of the Panthers, Louis Johnson, was killed, and the other two assailants escaped. One of the two surviving assassins, Flores Forbes, fled to Las Vegas, Nevada, with the help of Panther paramedic Nelson Malloy. In November 1977, Malloy was found by park rangers paralyzed from the waist down from bullet wounds to the back in a shallow grave in the desert outside of Las Vegas. According to Malloy he and Forbes were ordered by "higher‐ups" to be killed to eliminate any eyewitness accounts of the attempted murder of Crystal Gray. Malloy recovered from the assault and told police that fellow Panthers Rollin Reid and Allen Lewis were behind his attempted murder. Newton denied any involvement or knowledge, and said that the events "might have been the result of overzealous party members". During Newton's trial for assaulting Preston Callins, Callins changed his testimony several times and eventually told the jury that he did not know who assaulted him. Newton was acquitted of the assault in September 1978, but was convicted of illegal firearms possession. After the assassination attempt on Crystal Gray, she declined to testify against Newton. After two trials and two deadlocked juries, the prosecution decided not to retry Newton for Smith's murder. In January 1977, Jim Jones, leader of The Peoples Temple of the Disciples of Christ (commonly shorted to the Peoples Temple), visited Huey Newton in Havana, Cuba. After Jones fled to "Jonestown," a commune he established in Guyana for his followers, Newton spoke to Temple members in Jonestown via telephone expressing support for Jones during one of the Temple's earliest "White Nights". Newton's cousin, Stanley Clayton, was one of the few residents of Jonestown to escape the area before the 1978 mass murder of 900 Temple members by Jones and his fanatics through forced suicide. 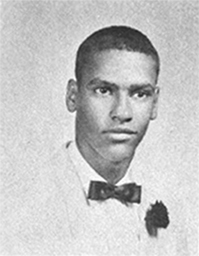 Huey Newton's senior year yearbook photo, 1959. Newton received a bachelor's degree from University of California, Santa Cruz in 1974. In 1978, while in prison, Newton met evolutionary biologist Robert Trivers after Newton applied to do a reading course with Trivers as part of a graduate degree in History of Consciousness at the University of California, Santa Cruz. He and Trivers became close friends, and they published an analysis of the role of flight crew self-deception in the 1982 crash of Air Florida Flight 90. Newton earned a Ph.D. in the Social philosophy program of History of Consciousness at the University of California, Santa Cruz in 1980. His doctoral dissertation entitled War Against the Panthers: A Study of Repression in America "analyzes certain features of the Party and incidents that are significant in its development." Among which are how the United States federal government responded to the BPP; in addition to the assassinations of Fred Hampton, Bunchy Carter, and John Huggins. Sources for material used to support the dissertation include two federal civil rights lawsuits. One suit was against the FBI and other government officials, while the other was initially against the City of Chicago. Later, Newton's widow, Fredrika Newton, would discuss her husband's often-ignored academic research on C-SPAN's American Perspectives program on February 18, 2006. On August 22, 1989, Newton was murdered in the neighborhood of Lower Bottoms, in West Oakland, California. Within days, Tyrone Robinson was arrested as a suspect; he was on parole and admitted to the murder to police, claiming self-defense. Police found no evidence that Newton was carrying a gun. Robinson was convicted of first-degree murder in 1991 and sentenced to a prison term of 32 years to life. Robinson's motive was to advance in the Black Guerrilla Family, a narcotics prison gang, in order to get a crack franchise. Newton's funeral was held at Allen Temple Baptist Church, where he was a member. Some 1300 mourners were accommodated inside, and another 500–600 listened to the service from outside. Newton's achievements in civil rights and work on behalf of black children and families with the Black Panther Party were celebrated. Newton's body was cremated, and his ashes were interred at Evergreen Cemetery in Oakland. In the song "Changes" by Tupac Shakur, Newton is referenced in the lyrics "'It's time to fight back,' that's what Huey said. Two shots in the dark, now Huey's dead" - although the lyrics were mistaken about the number of times Newton was shot when he was murdered. [Outro: Huey P. Newton] Uh, we view each other with a great love and a great understanding. And that we try to expand this to the general black population, and also, people-- oppressed people all over the world. And, I think that we differ from some other groups simply because we understand the system better than most groups understand the system. And with this realization, we attempt to form a strong political base based in the community with the only strength that we have and that's the strength of a potentially destructive force if we don't get freedom. The song "Up in Arms" (2015) by American songwriter Bhi Bhiman is based on Newton's life. Agnès Varda's 1968 documentary on the Black Panthers features extensive interviews with Newton during his incarceration. The comic strip by Aaron McGruder and related TV cartoon show The Boondocks featured a main character known as Huey Freeman, a 10-year-old African-American revolutionary, who was named after Newton; Freeman starts an independent newspaper, dubbing it the Free Huey World Report. The song "Same Thing" (2007) by band Flobots mentions Huey P. Newton: "Somewhere between prayer and revolution, Between Jesus and Huey P. Newton, That's where you find Jonny 5 shoot shootin', Water guns at the audience while ya scootin'." Newton is also mentioned By The Game in the song Dreams "The dream of Huey Newton, that's what I'm livin' through"
Newton is mentioned in the Ramshackle Glory song "From Here Till Utopia"
Newton is mentioned in Public Enemy's Welcome to the Terrordome, "The shooting of Huey Newton, From a hand of a nig who pulled the trig"
The song "Free Huey" by the Boo Radleys, from their Kingsize album is about the activities of the Black Panther Party when Huey Newton was an activist. The title of the song "Huey Knew" by Ab-Soul is a nod to Huey Newton. ^ Stein, Mark A.; Basheda, Valarie (August 22, 1989). "Huey Newton Found Shot to Death on Oakland Street: Black Panthers Founder Killed in High Drug Area". Los Angeles Times. Retrieved July 26, 2013. ^ Pearson 1994, p. 276. ^ a b c "Huey P. Newton biography". Africa Within. Biography Resource Center. Archived from the original on June 17, 2011. ^ Jones, Jackie (February 17, 2009). "Black History Month Faces and Places: Huey P. Newton". BlackAmericaWeb.com. Archived from the original on March 13, 2009. ^ Gates, Anita (February 13, 2002). "An American Panther, In His Own Words". New York Times. Retrieved April 25, 2009. ^ Revolutionary Suicide (Penguin Classics Deluxe Edition, 2009). Chapter 8: "Moving On". ^ Seale, Bobby (1991). Seize the Time: The Story of the Black Panther Party and Huey P. Newton. Black Classic Press. p. 62. ISBN 978-0-933121-30-0. Retrieved 23 September 2012 – via Google Books. ^ Newton, Huey P. (2009). Revolutionary Suicide. Penguin. p. 65. ISBN 9781101140475 – via Google Books. ^ Newton, Huey P. (2009). Revolutionary Suicide. Penguin. p. 102. ISBN 9781101140475 – via Google Books. ^ Stephen, Curtis (Sep–Oct 2006). "Life of A Party". Crisis. 113 (5): 30–37. ^ "Huey P. Newton". Biography.com. A+E Television Networks, LLC. 2013. ^ Finley, Stephen C.; Alexander, Torin (2009). African American Religious Cultures. ISBN 978-1-57607-470-1. ^ Judson L. Jeffries (2006). Huey P. Newton: The Radical Theorist. ISBN 978-1-57806-877-7. ^ Newton, Huey P.; Hilliard, David; Weise, Donald (2002). The Huey P. Newton Reader. ISBN 978-1-58322-467-0. ^ Hillard, David (2006). Huey: Spirit of the Panther. New York: Thunder's Mouth Press. p. 277. ISBN 978-1-56025-897-1. ^ a b Austin, Curtis (2006). Up Against the Wall. Fayetteville: University of Arkansas Press. p. 150. ^ a b Newton, Huey P. (2009). Revolutionary Suicide. Penguin. pp. 17–18. ^ "Nation: The Odyssey of Huey Newton". Time. November 13, 1978. ^ Stein, Mark A.; Basheda, Valarie (August 22, 1989). "Huey Newton Found Shot to Death on Oakland Street: Black Panthers Founder Killed in High Drug Area, Oakland, C.A". Los Angeles Times. Retrieved July 26, 2013. ^ "The long history of Black-Palestinian solidarity" Archived 2014-03-04 at the Wayback Machine, Liberation, February 27, 2014. ^ Pearson, Hugh (1995-04-21). The Shadow of the Panther: Huey Newton and the Price of Black Power in America. Da Capo Press. ISBN 978-0201483413. ^ Pearson 1994, p. 68. ^ Pearson 1994, pp. 145–147. ^ "Witness Says Newton Shot Policeman". The New York Times. August 8, 1968. ^ a b "State Opens Case of Black Panther". The New York Times. August 6, 1968. ^ Newton, Huey P.; Hilliard, David; Weise, Donald (2002). ""Crisis: October 28, 1967" and "Trial"". The Huey P. Newton Reader. ISBN 978-1-58322-467-0. ^ Hillard, David (2006). Huey: Spirit of the Panther. Thunder's Mouth Press. ^ "Witness in Black Panther Trial Pleads Memory Loss". Sarasota Journal. Associated Press. August 14, 1968. p. 2. Retrieved October 30, 2017 – via Google News Archive. ^ "Case Against Newton Dropped". The Dispatch. Lexington, North Carolina. United Press International. December 15, 1971. Retrieved August 5, 2012. ^ Pearson 1994, pp. 7, 221. ^ Kane, Gregory (Mar 15, 1997). "Killer raises some troubling questions we need to hear". Baltimore Sun. Retrieved 14 February 2013. ^ Jones, Charles E., ed. (1998). The Black Panther Party (Reconsidered). Baltimore: Black Classic Press. p. 11. ISBN 978-0933121966. ^ Newton, Huey P. (1973). Revolutionary Suicide. New York, New York: Penguin Books. p. 350. ^ Revolutionary Suicide (Penguin Classics Deluxe Edition), p. 349. ^ a b Revolutionary Suicide (Penguin Classics Deluxe Edition), p. 351. ^ Revolutionary Suicide (Penguin Classics Deluxe Edition), p. 352. ^ Gorney, Cynthia (March 25, 1979). "Mistrial Declared in Newton Murder Case". The Washington Post. Retrieved 1 April 2018. ^ a b "The Odyssey of Huey Newton". Time Magazine. November 13, 1978. ^ Turner, Wallace (October 26, 1977). "Key Newton Witness Is Reported in Hiding". The New York Times. Retrieved August 20, 2018. ^ Valdemar, Richard (2012-09-12). "Inside the Black Panther Party". Police: The Law Enforcement Magazine. Retrieved 2018-08-20. ^ Allen-Taylor, J. Douglas. "The Shadow of the Panther by Hugh Pearson". Retrieved August 20, 2018. ^ a b c Turner, Wallace (November 22, 1977). "Huey Newton Denies Murder and Assault". The New York Times. Retrieved August 20, 2018. ^ Wilbur C. Rich (2007). African American Perspectives on Political Science. Temple University Press. p. [page needed]. ISBN 978-1-59213-109-9. ^ Pearson 1994, p. 315. ^ "Gunmen Try To Kill Witness Against Black Panther Leader". The Leader-Post. October 25, 1977. ^ a b Turner, Wallace (December 14, 1977). "Coast Inquiries Pick Panthers As Target; Murder, Attempted Murders and Financing of Poverty Programs Under Oakland Investigation". New York Times. ^ Smith, Thomas C. "Huey P. Newton Trial: 1968 - Two More Trials, Then a Dismissal". Law Library - American Law and Legal Information. Retrieved August 20, 2018. ^ "Huey Newton Wins In Retrial". Milwaukee Journal. AP. September 28, 1979. Retrieved August 5, 2012. ^ a b Reiterman and Jacobs (1982). Raven: The Untold Story of Reverend Jim Jones and His People. p. 369. ^ a b Newton, Huey P. (June 1, 1980). "War Against The Panthers: A Study Of Repression In America". University of California, Santa Cruz. Retrieved 12 February 2017. ^ "Suspect Admits Shooting Newton, Police Say". Associated Press in New York Times. August 27, 1989. Retrieved May 12, 2008. The police said late Friday that an admitted drug dealer had acknowledged killing Huey P. Newton, co-founder of the Black Panther Party. ^ Newton, Huey P. (June 1, 1980). "War Against The Panthers: A Study Of Repression In America". University of California, Santa Cruz. Archived from the original on November 2, 2006. ^ "Black Panther Party v. Levi, 483 F. Supp. 251 (D.D.C. 1980)". Justia Law. January 25, 1980. Retrieved 12 February 2017. ^ "Hampton v. Hanrahan". 600. 1979: 600. Retrieved 12 February 2017. ^ "Hampton v. Hanrahan". 522. 1981: 140. Retrieved 12 February 2017. ^ "Origins of the Black Panther Party". Retrieved February 16, 2019. ^ UPI (August 29, 1989). "Mourners Pay Last Respects to Huey Newton". Lodi News-Sentinel. Retrieved November 27, 2016. ^ "Dead Prez Propaganda Lyrics". ^ "In 'Rhythm,' Bhi Bhiman's Music Isn't Limited By National Borders". NPR.org. Retrieved 6 October 2015. ^ Datcher, Michael (October 2003). "Free Huey: Aaron McGruder's Outer Child is Taking on America". Crisis. pp. 41–43. Brown, Elaine. A Taste of Power. (Anchor Books, 1993). ISBN 0-385-47107-6. Dennis Hevesi, "Huey Newton Symbolized the Rising Black Anger of a Generation" (obituary), The New York Times, August 23, 1989. David Horowitz, "Hating Whitey and Other Progressive Causes" Spence Pub, September 1, 1999. "Huey P. Newton". Find a Grave. Retrieved June 11, 2013.